The world is still wondering what happened to Malaysian Airlines Flight MH370, which went missing five years ago; one former Boeing pilot has put forward yet another theory that might explain what caused the airliner’s disappearance, the Daily Star reports. According to Luke Warfield, a man with a background in both "law enforcement and aviation", the person allegedly responsible for the plane’s disappearance and subsequent destruction was likely none other than its captain, Zaharie Ahmad Shah. "Flight MH370's Captain Shah had reasons to commit suicide. His estranged wife had (reportedly) left him before the flight. His hero, a political activist, was sentenced to jail in a kangaroo court for homosexuality. Distraught, Captain Shah planned to end his life on his flight the next day", he said. As Warfield explained, in order to enact his plan, Shah likely used a "very sharp fire axe" which is stored in the cockpit next to the captain’s seat to be used in case of an emergency. "Once safely in cruise, Captain Shah programmed the turn into the flight computer, and after the co-pilot's hand-off with ATC he turned off the transponder and attacked the co-pilot with the fire axe", he claimed. However, Warfield speculated, the co-pilot fought back and managed to severely wound Shah before being killed, leaving the captain exhausted and “losing blood rapidly from his wounds”, all of which probably led to him losing consciousness within a matter of minutes. "The Captain had reengaged the autopilot manually immediately after the attack and before he passed out. After he died of his blood loss,the autopilot would continue to fly on the last heading it was engaged on until the fuel ran out and the engines quit", Warfield noted. "The autopilot would continue to try to maintain altitude and rapidly put the B777 into a deep stall that would lead to a death spiral down in the ocean". The resulting descent would result in a "catastrophic crash" and complete disintegration of the doomed plane, he added, pointing out that this scenario is "completely congruent with all the known flight path data we possess at this time". 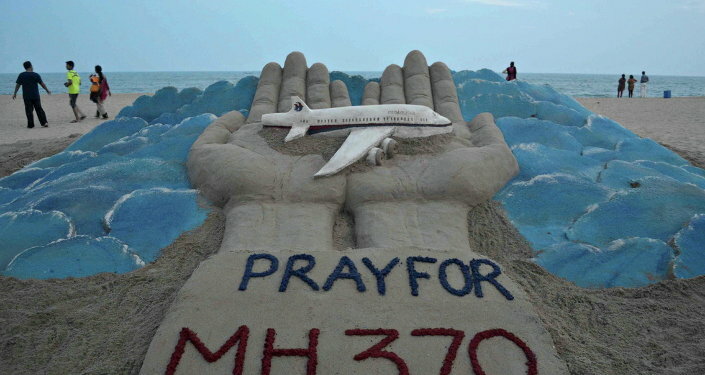 Malaysia Airlines Flight MH370 vanished above the South China Sea while en route to Beijing from Kuala Lumpur in March 2014, after making a leftward detour and flying toward the Indian Ocean; large-scale search operations launched after the plane’s disappearance have yielded no results.